Gold Star is the stage name of alternative country singer/songwriter Marlon Rabeneither. 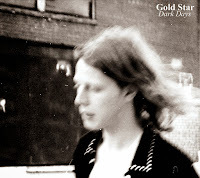 On June 2nd, he'll release his debut full length album under that moniker, Dark Days. The influences Gold Star draws upon truly runs the gamut of what can be described as the extended family tree of alt country. The mumbled vocals and self-pitying tone of "Sadie" sounds very much like countless Ryan Adams songs. Similarly, "Back To Me" is an alt country ballad that evokes thoughts of The Jayhawks. The vocals on tracks like "At the Dawn" and "With You" are delivered with a sense of emotional exhaustion. That makes them reminiscent of the two great ladies of alt country: Lucinda Williams and Emmylou Harris. The Southern Rock branch of the country/roots family is represented by the Drive-By Truckers-inspired "Get Down My Devil". Country blues comes to us courtesy of "Learning The Blues" and it's extended jam. "The Line" is sped up, with a gritty and chunky guitar. Needless to say, Dark Days is a bit scattergun. It's really a survey of Rabeneither's songwriting styles. Hopefully he can focus it a bit more on the next record to make a more powerful and lasting impression. Best tracks: "Get Down My Devil", "Reckless"